Our American made pine wood furniture is the best quality around and most affordable. This pine wood hunt board may look like an antique but it is Amish built and finished for each customer. You can customize the look of this pine wood furniture to fit in with you existing home decor. This dining room furniture comes standard with pine knobs, one adjustable shelf behind the raised panel doors and a shiplap tongue and groove back. Traditionally a hunt board was made to serve breakfast before or after a hunt. Now a hunt board also called a buffet or side board is used to store kitchenware, linens, and other types of household items. The Cambridge hunt board is crafted from quality pine wood by an Amish woodworker in Lancaster County, Pennsylvania. At DutchCrafters Amish Furniture Store we offer a wide variety of stains, paints and distressing options to customize the look of your new pine hunt board. You can also choose to order this unfinished or with a two tone finish possibly with the top stained and the base painted. You can purchase this hunt board online or at our furniture store in Sarasota, Florida. 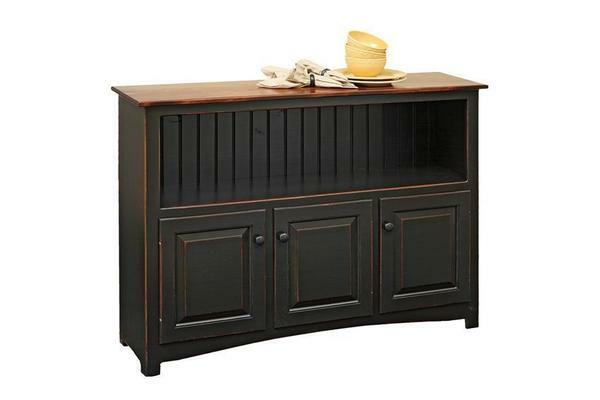 Call to speak to one of our helpful and friendly Amish furniture specialists at 1-866-272-6773.